Monmouth County Operation Watchdog, powered by the Monmouth County Sheriff’s Office encourages residents and businesses to register their privately owned home/business video surveillance in efforts to increase safety and reduce crime. Law Enforcement recognizes that crimes can be committed at any place or time and that home/business video surveillance may have captured vital footage that could help solve crimes in our community. During a criminal investigation officers are often unaware of the many residences and businesses that have surveillance systems who may have captured footage of value to the investigation. Having knowledge of the location of a surveillance system in the area of a crime could be instrumental in a successful resolution. There are several benefits to registering with the Monmouth County Operation Watchdog, powered by the Monmouth County Sheriff’s Office. It expedites the retrieval of footage from surveillance systems close to the crime scene in an effort to uncover criminal activity. It also reduces the number of officers assigned to canvass the area around a crime scene for operational surveillance systems. This allows officers assigned to the investigation to be deployed to other tasks in the investigation thereby enabling a higher degree of efficiency of allocated resources. Please note that this program does not give police the ability to tap into any home or business surveillance feeds. 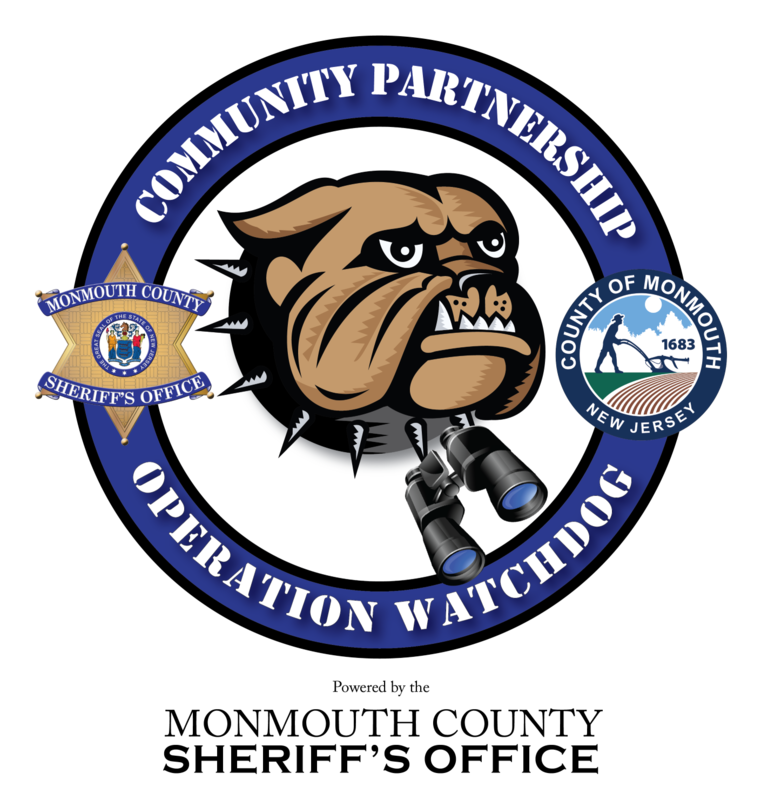 If you are signed up for Operation Watchdog and a crime occurs in your neighborhood, you may be contacted by an Officer who would ask if you could examine the time frame in question for potential video footage. If your equipment was able to record pertinent information, we would arrange a convenient time and day to retrieve the footage from you. Your participation in Operation Watchdog always remains 100% voluntary and your personal information will be kept confidential and not for public dissemination. Only law enforcement personnel can view the surveillance footage. Any Monmouth County business or home owner who would like to share the location of their cameras (inside and outside) with Law Enforcement in Monmouth County. Remember, participation is voluntary and by providing location information law enforcement will NOT have a direct feed into your camera system. Confirmation: Once the application is completed, a member of your local law enforcement agency will follow up with you to confirm your information. Call for Assistance: Law Enforcement agencies in Monmouth County will only contact you if there is a criminal incident in the area of your security cameras. Police personnel may request a copy of any video captured by your cameras which may be pertinent to the investigation. Any video footage collected by a law enforcement agency relating to criminal activity may be used in the investigation and as possible evidence. Video footage provided to a law enforcement agency is reserved for Official Use Only. Under no circumstances shall registrants construe that they are acting as an agent/employee of a law enforcement agency through the Operation Watchdog program. When necessary ta law enforcement agency will contact you directly using the information provided to obtain security camera footage. You agree not to release any video footage or still images to the media without consulting with your local law enforcement agency.